In case you didn’t know quite yet how much of an organisation freak I can be, the following should dispel any lingering doubt. I’m aiming to finish a garment every 10 days or thereabouts. Wherever applicable, pictures of ready-to-wear inspiration and patterns are linked to their corresponding websites. Notes: to make in turquoise knit. Note: make shorter hem to compensate for flat-heeled shoes. One in a solid colour (antique mauve or black), one in a print (purple/black/white knit). Notes:Make a sleeveless version, in deep purple knit; make a 3/4-sleeved version with lengthened hem to account for bigger belly in later autumn/winter. Notes: Long-sleeved version, with lengthened hem to account for bigger belly in later autumn/winter. Notes: Time allowing, make one sleeveless for early autumn (white cotton jersey); make another with long sleeves, and lengthened hem, to account for bigger belly in later autumn/winter. Notes: should have enough red fabric for this. Note: second coat shouldn’t take too long to make; useful for early winter. First coat for colder season. Vitamin D by Heidi Kirrmaier (Pipibird). In a denimy blue. Idlewood by Cecily Glowik MacDonald. Knit longer, as a dress. 2. Slippers (to knit and felt, or to sew – I lean towards knitted and felted). Ooh, just loving the rasberry coat. That's my fave. I like the patterns that offer teen, ladies and maternity options all-in-one. The knitted dress idea is also fabulous. Knitwear is so versitile. You certainly do have your work cut out for you though, don't you?! 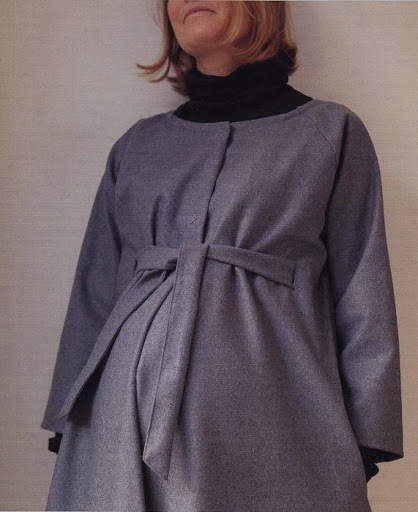 My mother made 90% of her maternity clothes in the 1960s and I must say, they would still be stylish today. You are creating lasting heirlooms with your own clothing. This is all so exciting! I absolutely adore 'Les Intemporels pour Futures Mamans'. I am truly so very happy for you and wish you much creative energy with all these projects. When you have a moment (which I doubt with all this sewing in mind) would you pop over and answer the question at the end of my current post? I am curious to find out more about your creativity. Lovely wardrobe!! I am so happy for you. Awesome choices. If you need more patterns, burda had some in their August issues a few years back. We can get those in the library (not that we can get anything else exciting craftwise there….). I'm looking forward to seeing your finished project but please: don't stress yourself. I got a couple of very nice shirts second hand…. wouah, tu as prévu de faire toutes ces affaires! Wow! You have BIG plans :o) I love the rspberry coat. That's going to be stunning! Love your plans! There are some great ideas in here. Whew! I am tired just thinking about YOU doing all that creating. The coat is a big project. Have you ever done one before? All these things will be so nice to have, and you can probably reuse them if you decide to have more babies. Remember, after baby is born, your body will not instantly snap back to it's former shape, so it is good to have the stretchy tops for a few months. Don't forget that the bustline increases significantly during pregnancy and even more should you chose to nurse your baby. Have you considered some patterns designed to accommodate breast feeding a baby? I was hoping you would post this! I love the planning stage too. I really like all your choices, so elegant and versatile too. Happy sewing and hoping you can make all you have set out to accomplish! These are very inspiring outfits. I'm rarely inspired in fall. I miss the crutch of flip flops and skimpy tank tops. But I've made a resolution to be less label-conscious.Right now I'm thinking over-the knee boots, bright tights, Moto gear, maybe even a cape…what do you think is a must for fall?